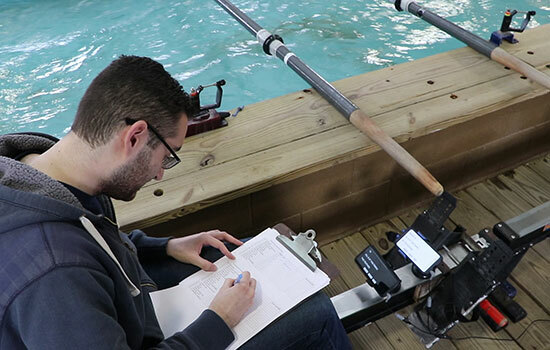 RIT student Steven McClusky works on the accessible rower developed at NTIDâ€™s Center on Access Technology. The project, which uses Automatic Speech Recognition to allow deaf and hard-of-hearing athletes to understand the coxswain, will be on display at Imagine RIT on April 28. As part of Imagine RIT: Innovation and Creativity Festival, researchers at NTID’s Center on Access Technology will demonstrate an accessible rower that allows deaf and hard-of-hearing athletes to understand the commands of the coxswain during competitions. Festival visitors can sit in a canoe and test their reflex response times by using a game pad to reply to visual cues displayed on a smartphone. The idea for the accessible rower came about in 2016, with the addition of a deaf rower to the men’s rowing team roster, with the possibility of other deaf and hard-of-hearing athletes joining the squad. In rowing competitions, rowers are required to follow commands from the coxswain, who determines the speed of the boat. Most boats include hearing rowers and coxswains who use voice to communicate. As a result, deaf and hard-of-hearing athletes may not have a way of understanding the coxswain during competitions and often resort to following other rowers. According to Wendy Dannels, a research faculty member in NTID’s Center on Access Technology and one of the project coordinators, the solution provides a visual display showing transcription and/or illustration for deaf and hard-of-hearing athletes to obey coxswain’s commands. The application was developed to help the athletes synchronize with the coxswain by using a custom Automatic Speech Recognition engine. The engine is offline so the deaf and hard-of-hearing athletes can utilize the technology without internet connection. In addition to Dannels, project team members are Steven McClusky, a fourth-year software engineering student from Blue Springs, Mo. ; Joseph Stanislow, instructional/support faculty, NTID Information and Computing Studies; and Brian Trager, associate director of the NTID Center on Access Technology.